Teamwork is essential to improving the quality of patient care and reducing medical errors and injuries. But how does teamwork really function? And what are the barriers that sometimes prevent smart, well-intentioned people from building and sustaining effective teams? Collaborative Caring takes an unusual approach to the topic of teamwork. Editors Suzanne Gordon, Dr. David L. Feldman, and Dr. Michael Leonard have gathered fifty engaging first-person narratives provided by people from various health care professions.Each story vividly portrays a different dimension of teamwork, capturing the complexity--and sometimes messiness--of moving from theory to practice when it comes to creating genuine teams in health care. The stories help us understand what it means to be a team leader and an assertive team member. They vividly depict how patients are left out of or included on the team and what it means to bring teamwork training into a particular workplace. 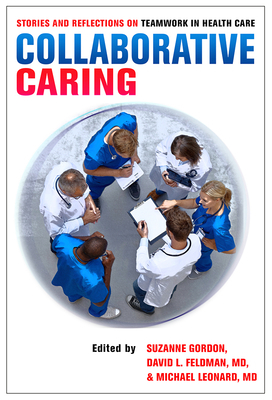 Exploring issues like psychological safety, patient advocacy, barriers to teamwork, and the kinds of institutional and organizational efforts that remove such barriers, the health care professionals who speak in this book ultimately have one consistent message: teamwork makes patient care safer and health care careers more satisfying. These stories are an invaluable tool for those moving toward genuine interprofessional and intraprofessional teamwork.